The latest Sauna World Championships ended in tragedy on Saturday 7th August 2010 when one of the finalists died. Vladimir Ladyzhenskiy, a Russian amateur wrestler, in his 60's, along with rival veteran Timo Kaukonen both collapsed with severe burns after about 6 minutes into the round. Tapio from Lahti, Finland comments: "I'll begin by saying that the temperature or the duration of the stay aren't the worst parts, it's the humidity that hurts and in this competition 0.5 litres of water is tossed on the hot stones every 30 seconds. That's what I call insane! Most Finns don't look up to these people who just want to see who has the biggest tolerance for pain by scalding themselves. I for one enjoy bathing in a sauna and feel that sauna is a nicely warm place for people to escape daily routines, not about searing oneself. If anyone of you ever visit Finland and still - after this horrible incident - dare to visit a sauna, please do! It just might change your minds!" Have you ever heard of the Sauna World Championships? Most people haven’t. The Sauna World Championships are held every August in Heinola, Finland. Thousands of sauna hungry spectators flock to the sauna competition while 50+ take part in the event. So what are the Sauna World Championships? It’s quite simple, the competition tests to see who can stay in a hot, sweltering sauna the longest. Sounds crazy? It’s true, hard men and women push their bodies to the limits in front of thousands of spectators and TV audiences. Some do it for fun, others to appease their competitive nature, while some do it to prove they have the most guts to withstand the fiery sauna heat the longest. What sauna temperatures are reached? Before the contestant starts, the sauna is pre-heated to 110ºC, that’s already 20-30ºC higher than the average person will stay in a sauna. For those who work in Fahrenheit, that's 230 Fahrenheit. Considering that water boils at 100ºC, you get some idea of the stress the competitors are putting their bodies through. However, saying this, sauna heat is different to the heat of the normal English summer where the sauna has a low humidity of 10-25%. This means the body can cool itself more efficiently as sweat can evaporate more easily, taking along with it the body’s heat. Every thirty seconds, half a litre of water is thrown onto the hot sauna. This löyly blast substantially increases the temperature of the sauna. Gas mark 1 on an oven is 140ºC, therefore with each löyly blast the sauna becomes more and more like an oven. The contestants have to sit with their buttocks and thighs on the bench, with their elbows on their knees, their arms raised, with a good posture. The contestant has to stay in this position and if they touch their skin they are disqualified. If they can’t make it out of the sauna by themselves and need the help of an official, they are disqualified. The rules are strict, but needless to say, this competition isn’t for the weak of heart. 2010 Competition suspended due to tragic death of Vladimir Ladyzhenskiy. 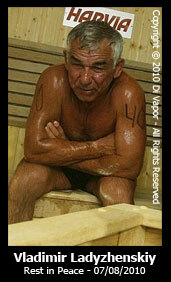 The 2003 champion and world record holder Timo Kaukonen, stayed in the sauna for a massive 16 minutes 15 seconds. Some competitors don’t even last two minutes, and some of the most seasoned sauna users only manage to last five to six minutes. At first glance staying in a sauna for 5-6 minutes doesn’t sound too difficult, let alone 16 minutes. The starting temperature of the sauna in the Championships is 110ºC and this heat is increased every 30 seconds. With this in mind and knowing the contestants only stop when their body is at its limits, it’s not recommended to try such a feat. To paint you a sharper picture, many contestants experience first degree burns and have red and pink blotchy skin after experiencing such heat for this short amount of time. That doesn’t sound too tempting, does it? I recommend the use of a sauna for pleasure and health, not as an extreme sport! However, if you are determined to become the next Timo Kaukonen, seek medical advice before you start. Most people who enter the competition are seasoned sauna users and have been using them consistently for many years. Note: Di Vapor is not responsible for the views, opinions or advice represented in the articles on this site. You are advised to seek medical advice before following any such information. Copyright © 2005-2016 Di Vapor.